Two fascinating Royal Enfield motorcycles are owned by Don McMahan, of Lino Lakes, Minn. (it's just north of the twin cities). 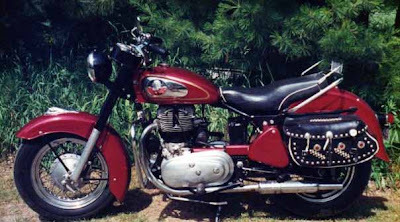 He was kind enough to share with me the story of his 1967 Royal Enfield Interceptor, stolen from him in the mid-1970s, recovered three years later, and then rebuilt for him by the legendary George Helm. More about that next time. 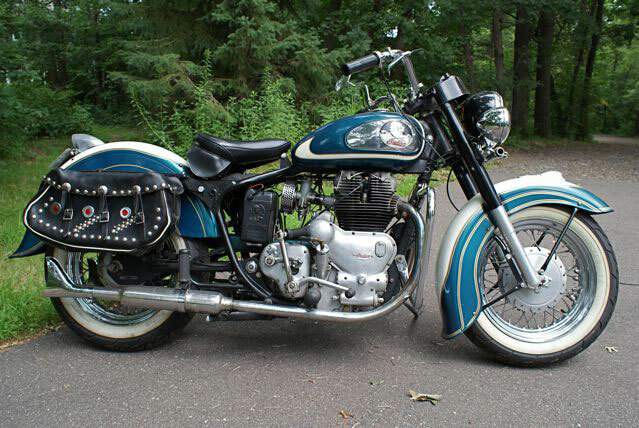 But first, the story of McMahan's 1959 Royal Enfield built Indian Chief. Looks different, doesn't it? Well, it is. Royal Enfield twins were being rebadged and sold as Indians in the United States in the 1950s. With the Chief, Royal Enfield went the extra mile, stretching the wheelbase and using smaller diameter wheels to mimic the heavy, fat-tired look the Indian had when it was built in the U.S.
"George Helm was a dealer in the Chicago area at the time and his version of the story of the creation of the Chief went something like this: The Indian Sales Corp. was using the old Indian dealer network to sell British imports after the manufacture of Indian motorcycles stopped in 1953. The dealers were strung along with promises of new Indians next year, next year and so on. "By 1955, to quiet the unhappy dealers, Indian Sales Corp. started badging Royal Enfields as Indians, but the dealers still wanted a 'big' bike to sell to compete with Harley in the police market and touring segment. Finally, with much dealer input, the 1959 Chief was created. 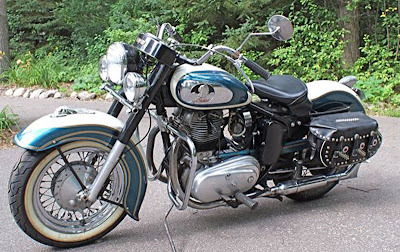 There were a few left over in 1960 and even though the badging of Enfields as Indians had stopped, some dealers sold the leftovers as 1960 models. "George's opinion was that there were probably more Chiefs now than there were sold new, since so many people had recreated them with some combination of old parts, like this one. "It's a bit'sa, put together by a past owner with a lot of original parts and George Helm's advice. I bought it without George's help and he kind of rolled his eyes when I told him what I'd bought. Never admitted to him what I'd paid for it. The constructor had tried to make it original and after some introspection I wasn't happy with that. "As purchased, you can't see how cobbed together it was and the Matchless tool box never looked right on the Chiefs that had it. Also it doesn't have the correct Chief tank, which is larger; this is a Trailblazer tank. "Since it was a bit'sa I didn't have any regrets making it into what I wanted (although I am thinking of having the stock saddle redone so I can put the seat rail back on — it has a solid cast plaque that reads 'Indian' facing back that was an accessory created by the Chicago area dealers).
" I've been in fiberglass all my working life, so I provided fiberglass fenders of my own design that I built to suggest more of the look of the '30's Indians (gave the originals to George; hope they found a good home); fiberglass toolbox that fits into the frame curve; and real Indian saddlebags that were with it when I bought it. "The light bar is a real Royal Enfield accessory on a bracket I built to fit the Chief, and the driving lamps are modern reproductions. It's still a 6-volt system. The handle bars are Yamaha Royal Star touring bars.
" I just couldn't resist the Sparto tail light, but since that's not enough light out back I recessed a reproduction '39 Ford tail light in the fender. 1959 — you have to have shark fin tips! "George didn't have time, or maybe I didn't have the time, when I needed to have this one gone through. As it turned out, it took 10 years after the rebuild to get all the mechanicals sorted out. It doesn't wear my leg out either, running on the magneto — starts with one kick. "I could go on, and on. Nothing like a Royal Enfield to start a conversation." 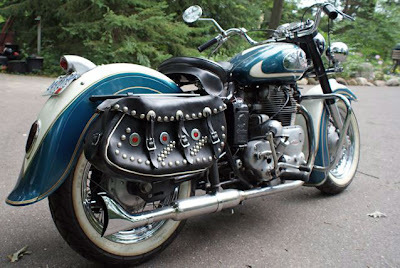 "One thing that I didn't mention before: the Chief's engine and transmission are from a 1961 Constellation (as I said before, it's a bit'sa put together by another fellow) however it is registered and licensed as a 1959 Indian. "As I remember, George Helm had some original paperwork that allowed him to get it titled as a '59 and provided that and a lot of the pieces in the bike for the guy who originally put it together." Thank you for the great pictures ... You have given me some fantastic ideas for my 2000 registered 500cc Bullet , though it was a cassic style with chromed tank I am now working towards something resembling the blue and cream bike at the beginning of this article which I think is truly beautiful & though mine is a single not a twin you have given me an idea as to making my bike stand out over here in the UK ...Thank you . I just recently found and purchased a 1955 RE Indian Trailblazer. It was a basket case, but 90 percent there. Missing fenders and few gauges left and right of the speedometer. Needs full engine and transmission rebuild as well as both front and rear hubs. I picked it up for under $1000. Can’t find many people with knowledge to help with the rebuild in Arkansas. Any suggestions? Did I make a good purchase? I think saving history is important, even though it’s not sought after by many us made indian enthusiasts, it’s still Indian history. I can send pics to anyone who wants to see it or has any info and recommendations on the path I should take. I don’t want to spend the money on the bike if it exceededs the value. I am not in it to make money, but to preserve its history. First, are you sure of what you have? If not, you can send the motor numbers and the frame numbers from the LEFT side (facing forward) of the headstock to Graham Scarth, chairman of the Royal Enfield Owners Club UK. The club has the factory records. Graham may be able to confirm exactly what you have. He makes no charge for his service. His email address is graham.scarth01@gmail.com He appreciates photos of the bike and the numbers as small differences can be important. Once you know what you have you can begin pricing what you need on the website of Hitchcocks Motorcycles, in the UK and Baxter Cycles in Iowa. You'll soon have an idea what you're in for. Join the Royal Enfield Interceptor group on Yahoo! Members are very helpful with advice. They know about all the Royal Enfield twins, not just the Interceptor. Good luck!